American Philosopher William James Durant (1885–1981) was a prolific American popularizer in the fields of history, religion and philosophy. He is best known for the 11-volume The Story of Civilization, written with his wife Ariel and published between 1935 and 1975. They were awarded the Pulitzer Prize for literature in 1967 and the Presidential Medal of Freedom in 1977. "India was the motherland of our race and Sanskrit the mother of Europe's languages. She was the mother of our philosophy, mother through the Arabs, much of our mathematics, mother through Buddha, of the ideals embodies in Christianity, mother through the village communities of self-government and democracy. Mother India is in many ways the mother of us all." "The Islamic conquest of India is probably the bloodiest story in history. It is a discouraging tale, for its evident moral is that civilization is a precious good, whose delicate complex order and freedom can at any moment be overthrown by barbarians invading from without and multiplying from within. Almost all the Muslims of South Asia are descendants of weaker elements of the population who had succumbed to forcible Islamic conversion." "I believe that the civilization India has evolved is not to be beaten in the world. Nothing can equal the seeds sown by our ancestry. Rome went; Greece shared the same fate; the might of the Pharaohs was broken; Japan has become westernized; of China nothing can be said; but India is still, somehow or other, sound at the foundation." If there is one place on the face of the earth where all the dreams of living men have found a home from the very earliest days when man began the dream of existence, it is India….For more than 30 centuries, the tree of vision, with all its thousand branches and their millions of twigs, has sprung from this torrid land, the burning womb of the Gods. It renews itself tirelessly showing no signs of decay. Mark Twain (1835-1910) also known as Samuel Clemens, one of the most widely loved and celebrated American writers since his first books were released in the late 1860s. "Land of religions, cradle of human race, birthplace of human speech, grandmother of legend, great grandmother of tradition. The land that all men desire to see and having seen once even by a glimpse, would not give that glimpse for the shows of the rest of the globe combined." "Our most valuable and most instructive materials in the history of man are treasured up in India." "Land of religions, cradle of human race, birthplace of human speach, grandmother of leagacy, great grandmother of tradition. The land that all men desire to see and having seen once even a glimpse, would not give that glimpse for the shows of the rest of the globe combined." For thousands of years, the Bhagavad Gita has inspired millions of readers. Here’s what some of the greats have to say in praise of this venerable scripture. Aldous Huxley was a great story teller and author of the highly acclaimed novel, Brave New World. Widely read, it came as no surprise to analyse his novel and conclude that perhaps, he was influenced by some ideas and theories depicted in Hindu epics. Sri Aurobindo (August 15, 1872–December 5, 1950) was an Indian nationalist, scholar, poet, mystic, evolutionary philosopher, yogi and guru. After a short political career in which he became one of the leaders of the early movement for the freedom of India from British rule, Sri Aurobindo turned to explore spiritual realms of human existence and, as a consequence, developed a new path which he termed integral yoga. Henry David Thoreau (1817 – 1862) was an American author, naturalist, transcendentalist, tax resister, development critic, sage writer and philosopher. 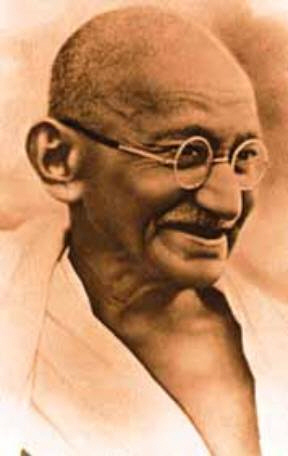 Mohandas Gandhi (1869 - 1948). Known as 'Mahatma' (great soul), Gandhi was the leader of the Indian nationalist movement against British rule. His doctrine of non-violent protest to achieve political and social progress has been hugely influential. His philosophy of nonviolence and his passion for independence began a drive for freedom that doomed colonialism. "The Bhagavad-Gita calls on humanity to dedicate body, mind and soul to pure duty and not to become mental voluptuaries at the mercy of random desires and undisciplined impulses." "The Gita is the universal mother. I find a solace in the Bhagavad-Gita that I miss even in the Sermon on the Mount. When disappointment stares me in the face and all alone I see not one ray of light, I go back to the Bhagavad-Gita. I find a verse here and a verse there , and I immediately begin to smile in the midst of overwhelming tragedies - and my life has been full of external tragedies - and if they have left no visible or indelible scar on me, I owe it all to the teaching of Bhagavad-Gita." Ralph Waldo Emerson (1803-1882) was born in Boston, Massachusetts, but he spent most of his life in Concord. His father was a Unitarian minister with a keen interest in fine literature who was instrumental in founding several important literary societies and publications of the time. The grief of the death of his first wife drove him to question his beliefs and his profession in the Christian ministry, turning him to other religions (including Hinduism) for evidence of vital truth. Emerson often presented Hindu principles in their original purity. Sometimes he would quote the scriptures directly. "The Bhagavad-Gita is an empire of thought and in its philosophical teachings Krishna has all the attributes of the full-fledged montheistic deity and at the same time the attributes of the Upanisadic absolute." Swami Vivekananda (1863 – 1902), was an Indian Hindu sage and one of the most famous and influential social reformers of the 19th century. A redoubtable spiritual leader, he was an exponent of Vedanta and Yoga. While he is widely credited with having uplifted his own nation, India, Vivekananda simultaneously introduced Yoga and Vedanta to America and England with his seminal lectures and private discourses on Vedanta philosophy. He was the first known Hindu sage to travel to the West, where he introduced Eastern thought at the World's Parliament of Religions, in connection with the World's Fair in Chicago, in 1893. "The secret of karma yoga which is to perform actions without any fruitive desires is taught by Lord Krishna in the Bhagavad-Gita." Jawaharlal Nehru (1889 – 1964) was a major political leader of the Congress Party, a pivotal figure in the Indian independence movement and the first and longest-serving Prime Minister of the Republic of India. He is popularly referred to as Panditji (Scholar) and Pandit Nehru. Rudolf Steiner (1861 - 1925) was an Austrian philosopher, literary scholar, educator, artist, playwright, social thinker, and esotericist. Hermann Hesse (1877—1962) was a German-Swiss poet, novelist, and painter. In 1946, he received the Nobel Prize in Literature. His best-known works include Steppenwolf, Siddhartha, and The Glass Bead Game which explore an individual's search for spirituality outside society. "The marvel of the Bhagavad-Gita is its truly beautiful revelation of lifes wisdom which enables philosophy to blossom into religion." Adi Shankara was an Indian philosopher who consolidated the doctrine of Advaita Vedanta, a sub-school of Vedanta. His teachings are based on the unity of the soul and Brahman, in which Brahman is viewed as without attributes. "I am a proud staunch Sanatani Hindu." "Hinduism has made marvelous discoveries in things of religion, of the spirit, of the soul. We have no eye for these great and fine discoveries. We are dazzled by the material progress that Western science has made. Ancient India has survived because Hinduism was not developed along material but spiritual lines." "Hinduism is a relentless pursuit of Truth. "Truth is God" and if today it has become moribund, inactive, irresponsive to growth, it is because we are fatigued; and as soon as the fatigue is over, Hinduism will burst upon the world with a brilliance perhaps unknown before." "Hinduism is a living organism liable to growth and decay subject to the laws of Nature. One and indivisible at the root, it has grown into a vast tree with innumerable branches. The changes in the season affect it. It has its autumn and its summer, its winter and its spring. It is, and is not, based on scriptures. It does not derive its authority from one book. Non violence has found the highest expression and application in Hinduism." "I think I have understood Hinduism correctly when I say that it is eternal, all-embracing and flexible enough to suit all situations." "I am a Hindu because it is Hinduism which makes the world worth living. I am a Hindu hence I Love not only human beings, but all living beings." "Hinduism is a living organism. One and indivisible at the root, it has grown into a vast tree with innumerable branches. Knowledge is limitless and so also the application of truth. Everyday we add to our knowledge of the power of Atman (soul) and we shall keep on doing so." "I have no other wish in this world but to find light and joy and peace through Hinduism." "Hinduism insists on the brotherhood of not only all mankind but of all that lives." "Hinduism is like the Ganga, pure and unsullied at its source but taking in its course the impurities in the way. Even like the Ganga it is beneficent in its total effect. It takes a provincial form in every province, but the inner substance is retained everywhere." "On examination, I have found it to be the most tolerant of all religions known to me. Its freedom from dogma makes a forcible appeal to me inasmuch as it gives the votary the largest scope for self-expression." "Hindu Dharma is like a boundless ocean teeming with priceless gems. The deeper you dive the more treasures you find." "Hinduism is like Ganges, pure and unsullied at its source, but taking in its course the impurities in the way." "It is impossible for me to reconcile myself to the idea of conversion after the style that goes on in India and elsewhere today. It is an error which is perhaps the greatest impediment to the world’s progress toward peace … Why should a Christian want to convert a Hindu to Christianity? Why should he not be satisfied if the Hindu is a good or godly man?" Romain Rolland (1866 – 1944) was a French writer and dramatist, essayist, mystic, pacifist, who was awarded the Nobel Prize for Literature in 1915. Romain Rolland saw that art must be a part of the struggle to bring enlightenment to people. He was a great admirer of Gandhi and in 1924 wrote a book on Gandhi. This book was important for Gandhi's reputation. The 2 men were able to meet in 1931. Throughout his life Romain Rolland retained a keen interest in Indian spirituality. He also wrote a biography of the great Hindu Saint Sri Ramakrishna. Romain Rolland was also a keen admirer of Sri Aurobindo a leading Indian nationalist and then teacher of Yoga. Romain Rolland was strongly influenced by the Vedanta philosophy of Hinduism, and authored several books on the subject. Let us return to our eagle's nest in the Himalayas. It is waiting for us, for it is ours, eaglets of Europe, we need not renounce any part of our real nature…whence we formerly took our flight. In the great philosophy of Brahma, such violent turns of the scale are quite unknown. It embraces vast stretches of time, cycles of human ages, whose successive lives gravitate in concentric circles, and travel ever slowly towards the center…."